A talented engineer launches his first product! Craig Newlander, is an Electrical/Computer Engineer with large company background, working with companies including Nielson Company, CNA Insurance and Abbot Labs. Two years ago, he approached us with a dream of launching a new product in the sporting goods arena. He’d developed a novel stove attachment that would reduce the noise and increase the cooking efficiency of portable camp stoves. He also had developed an ingenious approach to manufacture the attachment utilizing 3D digital printing technology. The trick was how to explain the product quickly, get the message to right people & make the sale. 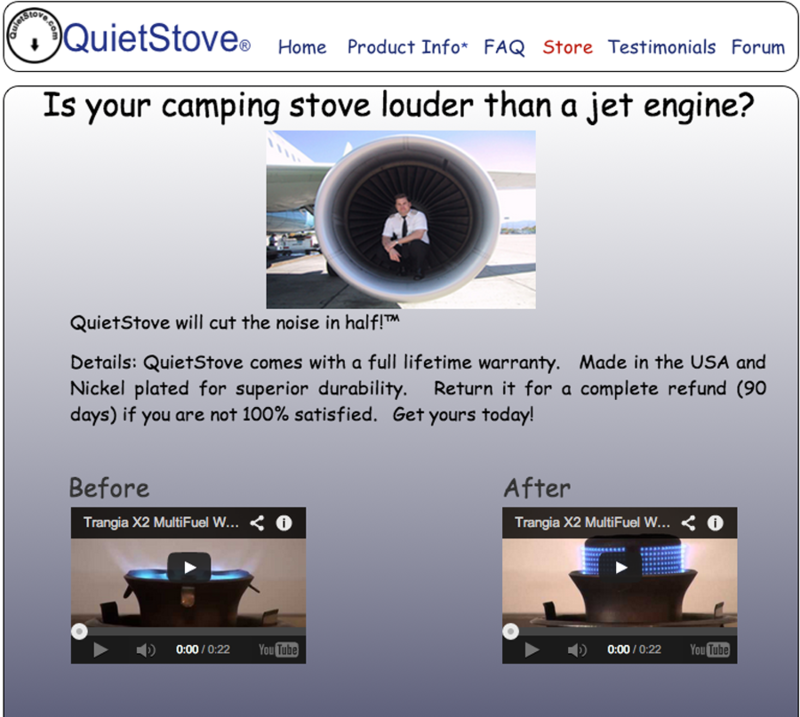 We helped Craig name the product (QuietStove), launch his website/on line store and develop a strategy to get the word out. The first step was to come up with a strong headline and combine it was an attention grabbing graphic. We thinking our man inside the jet engine certainly did the trick. We also included some simple before/after videos to prove that our product really works as promised! Our marketing strategy also included guest appearances on a variety of camping forums as well as an effective sales program on EBay and Amazon (foreign outlets).